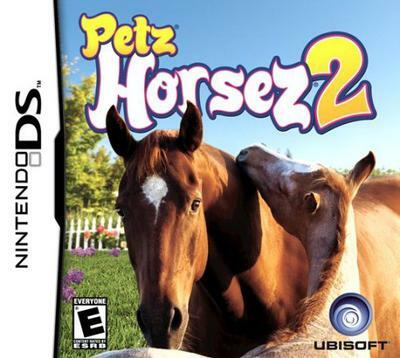 Petz: Horsez 2, is a really great game! You get to train, ride, and breed your horse and also go into competitions. But you also have to clean and care for your horse. It's a little different with foals because they run out of food really quickly and they can get sick if you don't care for them properly. From a scale of 1-10, I would rate it 9 because of how easily your foal gets sick and the challenge of trying to unlock all the training tracks. I WOULD LIKE TO PLAY THIS GAME. It's really another version of Pippa Funnel. I would have expected more out of it. It's really just about saving the stables through riding and competing. It's a lot like Nancy Drew: Mystery of the Ranch. It's more about being a sleuth then horse riding. I think it is way to similar, so I sold it on eBay and got a nice 20$. I've noticed that a lot of horse DS games haven't been the best but this one was good. It's cool how it actually has its own story line and different cool twists and turns. The ridding part of the game is also very good! It's fun :) The only cons about this game is that: It is kind of short and the story line go's by very quick, sometimes it can be boring(for example the trail rides are very long and not very interesting) and the last con is that after the story part is over there's really not much to do. So overall its fun but isn't the type of game u would play a long time. This is the awesomeness DS game ever! I've played and replayed it over and over and over! You do not get to choose your first horse's gender-it will be a male, no matter what-but you do get to breed it and raise and train the foals. Not sure how the training works (never got to do it?) but the riding courses are so much fun! More can be unlocked if you have a certain other game I am getting in the next month or so. It's fun and totally worth the cost. Also, you can ride from the start. Some boring dialogue. The horses are adorable; the foals are cute; the courses are amazing and in X country, Show Jump and Dressage as well. It is better than all my horse games! Can we use this game on Nintendo DSi xl? How do you get your foal too graze???????????!!!!!!!!!!!!!!!!!!!!!!!!!!!!!!!!!!!!!!!!!!!!!!!!!!!??????????????????? this games i do hope to those of you that have played it you like this game because it looks fun and enjoyable for 7 and up. I have never played this game and i hope you have. i love this game but im stuck with my foal. how do you get to graze? I own Horsez 2 game.I don't care much about the baby horses, I just care about the big ones. this game is so cool, if you have it and are reading this send a response i love this game soooooooooooooooooooooooo much because i don't have a horse go barbaro! This game is sooooooo fun. You can have foals and horses. You can go on trails with your horse and wash it and groom them. You have to take extra good care of the foals. You can talk to your grandpa. If I could play it very long I would play it for hours. .You can take care of foals too!!! I like it too. Sydney I agree with you. It is a 9 out of ten game!